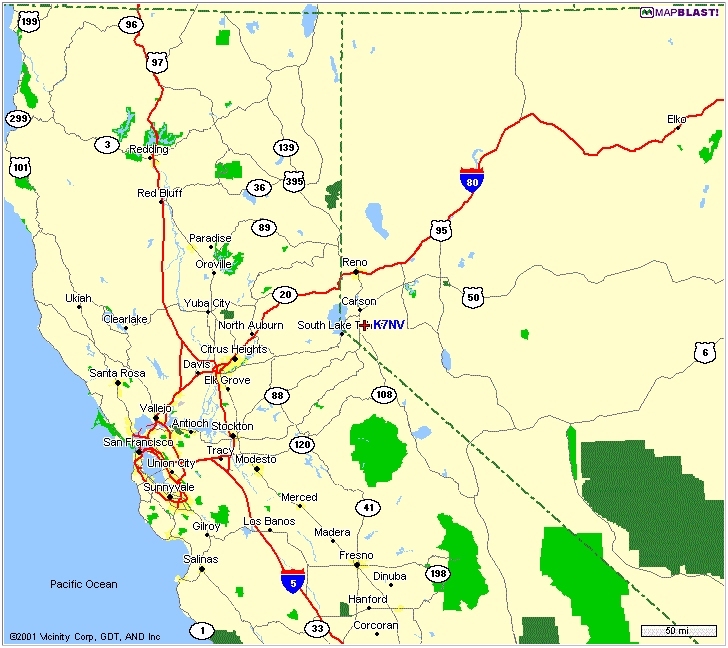 Where the heck is K7NV ? 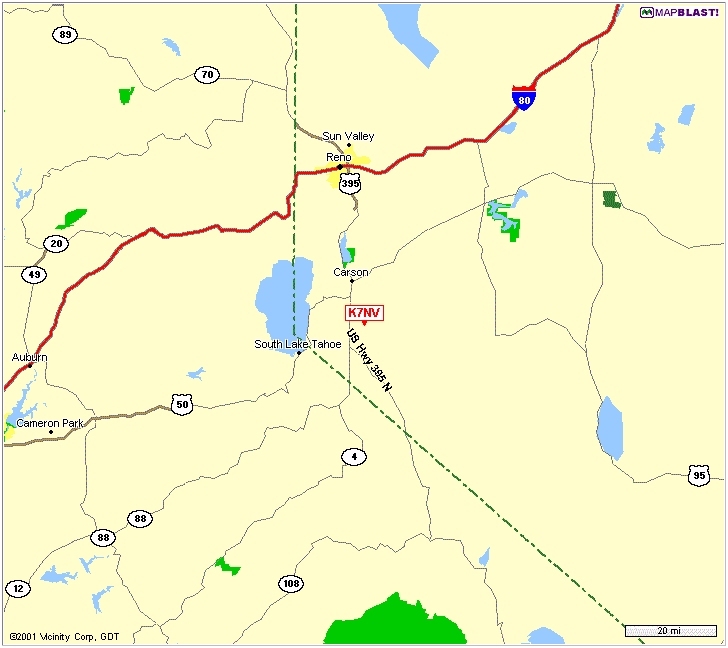 A 45 mile drive South from the Reno Airport, 13 Miles East of Lake Tahoe, and more importantly, 10 miles from the nearest Hardware Store in Carson City. The site is located on a mild ridge, running east-west up out of the Carson Valley, at an elevation of 4850 feet above sea level. Go North about 20 miles, as the crow flies and you get to have a cold one with Tom, K5RC. 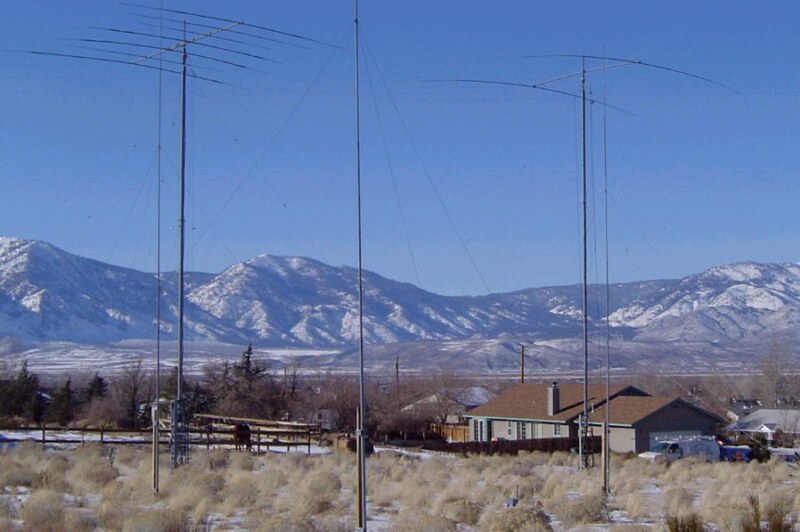 Up North of Reno, you will find Rich, N7TR, and Bill, K6GNX. Up in the mountains, around the lake are Jim, W6EU, Rick, N6XI, and other active folks. It's not "In the Middle of Nowhere", but you can see "it" from here! 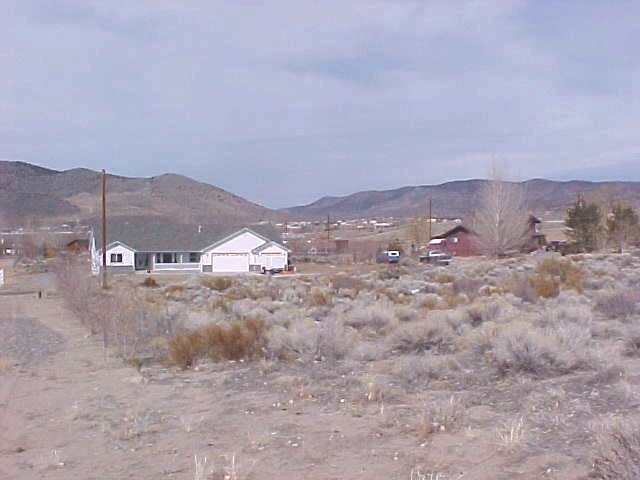 "The Middle of Nowhere" starts about 300m to the right of the K7NV icon, and goes all the way to Denver. Moscow is thru the notch in the hills. The terrain drops off about 40 feet over a 1/4 mile in that direction, then slowly rises to the hills. It's great fun when the bands are open to hear our EU ham friends making it into little old Minden. Eu pileups are always difficult from here. We don't hear all those 5 watters so well! The dilligent ones that hang in there usually make it into the passband and go into the log. I wish it was easier! Looking down into the Carson Valley (100 feet below) towards Japan. Tokyo is thru the notch in the mountains. The JA operators are always a pleasure to work when conditions exist. I wish we could hear everyone, but it doesn't always work out. 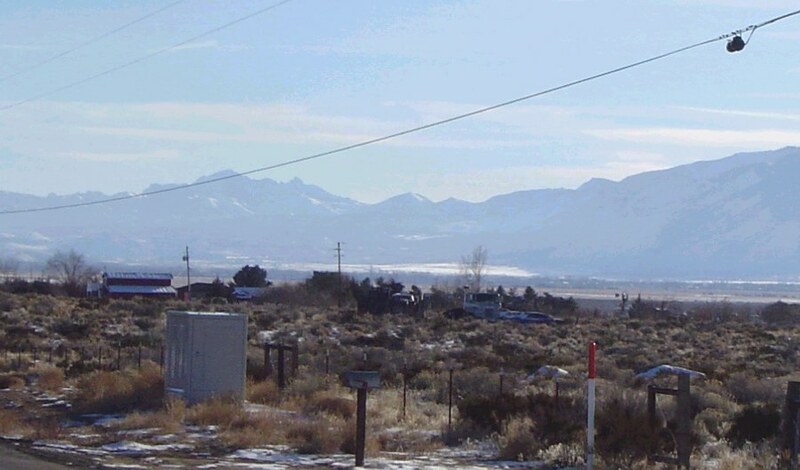 This picture was taken 1 block South of the site, looking down into the Carson Valley (100 feet below) towards long path Europe. Long path is always a real hoot in the mornings. The multi-path on 20 meters almost makes everything uncopiable. It often helps to have two antennas available to figure out which direction the EU guy, sending at 40 WPM (and completely uncopiable) is pointing his antenna. Sometimes, I actually figure out what that guy's callsign is! Kudo's to the fine op's that show up for the 40 & 80 meter openings to make those contacts possible from here! This is not a great site, it's just the best one I could afford, and being able to hear the folks that I can, when I can, is always a treat!